The versatility and mobility of a D-Series Wheeled Excavator often enables you to complete jobs using fewer machines in less time. Ideally suited for a number of applications, like ditch cleaning or road maintenance that require travel while using a work tool. 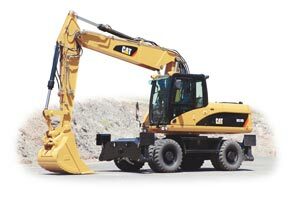 Able to travel up to 23 mph (37km/h), wheeled excavators can move quickly from job to job minimizing the need for additional transportation. Multiple auxiliary hydraulic options enable you to utilize a wide range of work tools. With a tool control system, you can preprogram flow and pressure for up to 10 different hydraulic work tools. Best in class visibility, to front, upwards and to both sides, standard rear video camera, which displays on monitor in cab. Ground-level service points provide safer conditions for fleet maintenance.